Plantar fasciitis is a condition of the foot, and it is the most common source of foot pain. 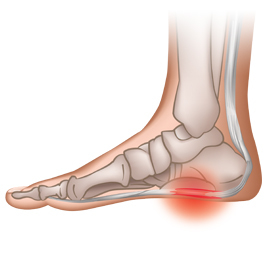 The name plantar fasciitis refers to the plantar fascia, which is the ligament that connects the heel to the toes and provides support to the foot’s arch. When the plantar fascia becomes strained or inflamed, it can cause pain, weakness, and swelling in the heel/arch area. Typically, plantar fasciitis develops slowly, over an extended period of time. You may begin to notice that you have pain in your heels when you first stand up out of bed in the morning; it feels like the bottoms of your feet are stretched too tight. This pain is sometimes also present after you are sitting for a long period of time. Some people feel better after they move about a bit and the feet loosen up; however, long periods of time on your feet can make the pain worse. Over time, this pain may worsen. Sometimes, people begin to walk or stand differently in order to compensate for the pain, which can lead to back, hip, or leg pain. Bone spurs can also develop as a result of plantar fasciitis. Wear shoe inserts for additional support. In more severe cases of plantar fasciitis, your doctor may recommend that you get steroid injections in your heels. In rare cases, surgery may be performed to release the tendon. Many people develop plantar fasciitis as a result of their job – performing repetitive activities or standing on your feet all day can strain the plantar fascia. Plantar fasciitis is common among athletes and members of the military. If your job requires you to be on your feet, you may not be able to rest and allow your condition to fully heal. Instead, you can cope with plantar fasciitis by stretching, applying ice, and taking anti-inflammatories. It is also especially important that you wear comfortable, supportive shoes and use shoe inserts, also known as orthotics, or custom arch supports. Orthotics can provide you with the comfort and support that your feet need, particularly when you don’t have the luxury of sitting down and putting your feet up. If you have plantar fasciitis, visit Foot Solutions. We have shoes for men and women that come in many different molds and are made to accommodate many foot conditions, including plantar fasciitis. We can even make customised adjustments to shoes, just for you. In addition, we have a variety of ready to purchase shoe inserts, as well as custom arch supports. At Foot Solutions, we have the tools that you need to relieve your pain.